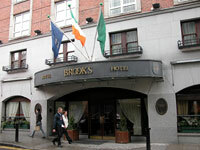 Perfectly placed in the heart of Dublin City Centre, Brooks Hotel is just a few steps from Trinity College, Grafton Street, Government buildings, Dublin Castle and most major attractions. This top quality hotel is well known for its high quality friendly service and attention to detail. The superbly decorated bedrooms in Brooks hotel are fitted with air-conditioning, colour teletext TV and data points with ISDN connection. The guest will enjoy TV and radio piped to the bathroom, power showers, king size beds, personal safes, minibar, trouser press and ironing board. The hotel offers private banqueting for up to 25 guests. Excellent conference facilities include the 60-delegate theatre-style Market Room and smaller syndicate rooms for 12 people. The award-winning Francesca's Restaurant provides mouthwatering cuisine featuring modern Irish and International Organic dishes. Situated off Grafton Street the perfect location for a days shopping in the capital. For theatre lovers The Gaiety, Olympia and Andrews Lane theatres are all a short walk away, and less than a ten minute walk brings you to the Abbey and the Gate. Dublin's top tourist attractions are within easy reach and there is a wide variety of superb restaurants close by.